The total solar irradiance (TSI) is the amount of solar radiative energy impinging on the Earth's upper atmosphere. 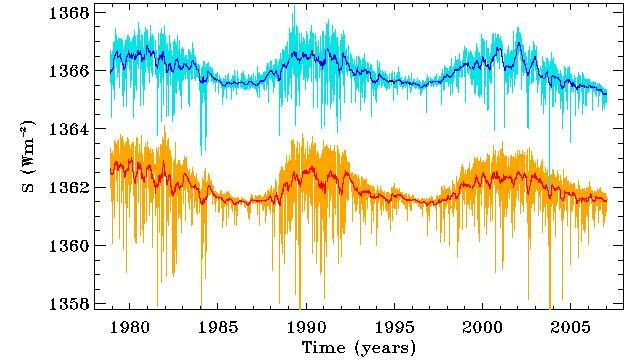 As can be seen on Figure 1 below, the TSI is observed to vary in time on a variety of timescales, including a prominent variation in phase with the solar magnetic activity cycle, with yearly averages going from 1365.5 Watt per square meter at solar minimum, up to of 1366.6 at maximum. Superposed on this slow trend are fluctuations about the means of about +/- 1 Watt per square meter on timescales of a few days. Interestingly, the Sun is slightly brighter at solar maximum, even though sunspots are darker than the rest of the solar photosphere. This is because at solar maximum, a great many magnetized structures other than sunspots appear on the solar surface and many of them, such as faculae and active elements of the network, are brighter than the photosphere. They collectively end up slightly overcompensating for the overall irradiance deficit associated with the larger but less numerous sunspots. Figure 1: Temporal variation of the total solar irradiance from 1978 to the present. The light blue curve shows daily values, and the thick blue curve a 81-day boxcar running average. The pronounced day-to-day variations in TSI (light blue) are real, rather than the result of measurement uncertainties. This data composite is provided by the PM Observatorium in Davos, Switzerland. The orange and thick red curves are produced by one of our simulation runs, described further below. The curves for the modelled TSI have been shifted downwards by 4 Watt per square meter. Recent observations indicate that the primary driver of TSI changes is the varying photospheric coverage of these different types of solar magnetic structures, although contributions from long-timescale variations associated with a deep-seated physical process, such as cycle-mediated small changes in the efficiency of convective energy transport, cannot be ruled out entirely as yet. Our goal has been to produce a physical model for TSI variations, i.e., a model based not on empirical correlations between various classes of surface magnetic structures, but rather on a (simplified) physical model linking these structures. Our starting point, observationally well-supported, is that large structures such as sunspots fragment and decay away, releasing in the process smaller magnetic structures over the solar photosphere. We model this as a stochastic fragmentation process, complemented by boundary erosion. We inject spots and active regions on a model solar surface, according to observed emerging sunspot area data. Under the action of fragmentation and erosion, this then yields a time-evolving size distribution of magnetic structures, which can be convolved with an semi-empirical photospheric emissivity contrast curve (brightness deficit/excess as a function of size), to produce an evolving TSI. We also account, albeit statistically, for spot emergences occurring on the backside of the sun. The model involves a number of adjustable parameters, which are determined by simultaneously fitting the 1978-2007 TSI and spot area time series. This is a complex multimodal, multi-objective and partly stochastic optimization problem, which we tackle with the genetic algorithm PIKAIA. The orange/red curves on Figure 1 is one such best-fitting solution, which indeed is quite similar to the data, although not in all detail of course given the stochastic nature of the fragmentation process and of the backside emergences. Having thus fixed the adjustable parameters in our model by best-fitting the 1978-2007 time interval, we can use it to reconstruct the irradiance variations since the beginning of the Royal Greenwich Observatory sunspot area dataset, namely 1874. The result of this exercice is shown on Figure 2 below. As expected for a constant quiet sun background irradiance, the irradiance variations follow rather closely the variations in emergence rates, itself closely correlated to the variations in the solar cycle amplitude, as measured in sunspot number. 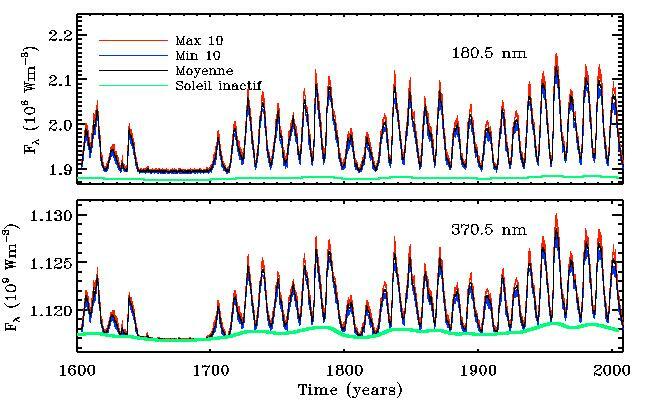 Figure 2: Temporal variation of the total solar irradiance from 1874 to the present, as reconstructed by our physical model. The orange curve shows daily values for a single representative solution, and the thick red curve mean +/- one sigma for 1000 realization of the best fit model. This specific reconstruction assumes a temporally constant quiet-sun irradiance. MOCASSIM (MOnte CArlo Solar Spectral Irradiance Model) is a spectrally-resolved four-component version of the TSI model described above, targeted at the near- and mid-ultraviolet (150-400nm). MOCASSIM uses the low-activity ATLAS-3 spectrum to set the quiet sun spectral irradiance, and synthetic spectra at 5250 and 2750 K to set the monochromatic contrast ratio of sunspots. The spectral contribution of faculae is calculated using a simple black body inversion procedure, and the network contribution is included as a stochastic emission process. Reconstructions carry back to the year 1610 through a Monte Carlo simulation of sunspots emergence driven by the sunspots number time series. A modulation of quiet sun emissivity is also introduced, based the TSI reconstruction of Tapping et al. (2007). 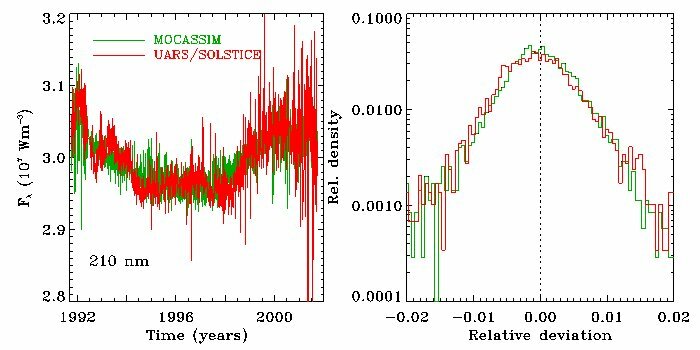 Figure 3: Left: time series of spectral irradiance at 210 nm, as reconstructed by MOCASSIM (in green) over the 1992-2001 time interval spanned by UARS/SOLSTICE observations (in red). The plot on the right shows dthe frequency distribution of photometric residuals with respect to a 81-day running mean. These plots show that MOCASSIM properly catches yearly-to-decadal variations, while yielding a good statistical representation of fluctuations on shorter timescales. 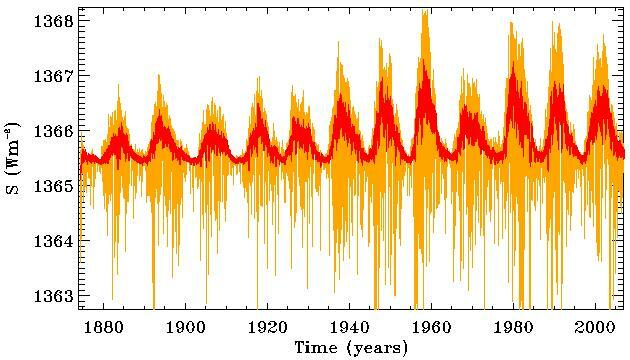 In its current form, MOCASSIM allows reconstruction of spectra and spectral irradiance time series across the 150 to 400 nm range, starting all the way back with the beginning of the sunspot record in 1610. Figure 4 belows shows two examples at 180 and 370 nm. Note how, during the 1645-1705 Maunder Minimum, at the shorter wavelength the emissivity remains significantly above the quiet-sun emissivity (thin green line), even though few or no sunspots are emerging at the photosphere. This is due to the contribution of the magnetic network, which however decreases rapidly with increasing wavelength, and is insignificant at 370 nm. Figure 4: Two reconstructions of spectral irradiance variations in the ultraviolet domain, starting in 1610. On each panel, the green line is the quiet sun contribution, computed from the TSI reconstruction of Tapping et al. 2007. The black line is the average of ten reconstructions using different stochastic realisations of sunspot emergences, and the red and blue lines indicate the min/max values associated with this set of ten statistically independent reconstructions. Tapping, K., Boteler, D., Crouch, A.D., Charbonneau, P., Manson, A., & Paqu ette, H. 2007, Modelling solar irradiance during and since the Maunder Minimum, Solar Physics, 246, 309-326. Crouch, A.D., Charbonneau, P., Beaubien, G., & Paquin-Ricard, D. 2008, A model for the total solar irradiance based on active region decay, The Astrophysical Journal, 677, 723-741.